This Jack Bilander print, named “Sammy,” has been for sale for a year, overpriced and lingering out of reach, and I have yearned for it. My want has surpassed the call of nostalgia. Perhaps my desire is simply from the mere wanting of it. I saw a performance at the NOLA Fringe Fest in which a character from the narrative dismisses his desire and lust for the woman he loves by admitting that desired objects are interchangeable. A hole, he states, is just a hole. Well, yes, that’s obvious, isn’t it. The point of a hole is that it remains incomplete, never filled. It will always be empty and vacant. I bought this sweetly etched boy tonight. The seller dropped the price after a year of my desiring. I snatched it up with the ferocious swiftness of a fat-fisted child in a school yard fight. Is it an art collector’s greed, the hunger of nostalgia, or just lack? Update, 11/18/17: You can never go home. The Chelsea of the 70s no longer exists. I keep looking. I’ve learned new words for things I’ve blogged about over the years. To the idea of ontological homelessness I now add home insecurity and food insecurity. I am hording these pictures in the sunlight. I’m so glad you posted! I’m so glad that Jack has so many fans! I would love to see pictures of your etchings. 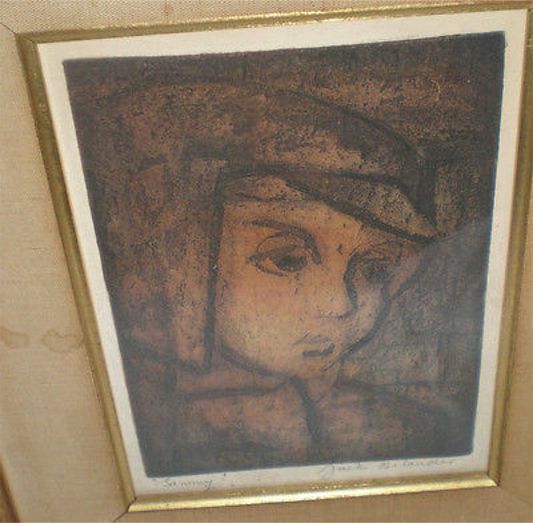 I am a niece of Jack’s and this etching is of a cousin of mine, Sammy, one of his nephews. I would be curious to know where you have found his work and the price range of his etchings. I do like them and have been thinking of buying more of them. Appreciate the information. Hello Carla! I would love to see a photo of Sammy! I’ve seen some of the prints go for upward of 300.00 and as low as 10.00 or 15.00. On average, they are around 50.00. I’ve let some go on E-bay that I liked a lot, but I wouldn’t pay much for. I’ve been ripped off a couple of times, too. I’m getting better at identifying what’s what. I’d love to hear more about your family. Hi. You write so very evocatively and beautifully. Jack was my cousin and I loved reading your remembrances of him. I spent a great deal of time both in his apartment and his studio over many years, and I too remember those smells, watching him at work, the plants near the bars on the window sill, joining him at his favorite restaurant in Chinatown, chowing down on iron steak and barbecued shrimp… I think I might have a couple of etchings that I would be happy to send to you if you are interested. Hello, Today I came across this print called “Sammy” 1 with Jack Bilander 53 signed on one side in pencil. I am not an art person but the print sucked me in so i took it home. I was trying to find more info on it when I came across this post. Can someone tell me more about this artist. Did he sign all his work in pencil? Does the 53 stand for 1953. Any info would be awesome. 53 means it is the 53 print in the series, I expect. You can google Jack Bilander and find out a little about him on the Ro Gallery website.